Many people are unaware that you can mix Mr. Color Leveling Thinner (MLT) with other brands of paint besides Mr. Color. Most notably, Tamiya acrylics! 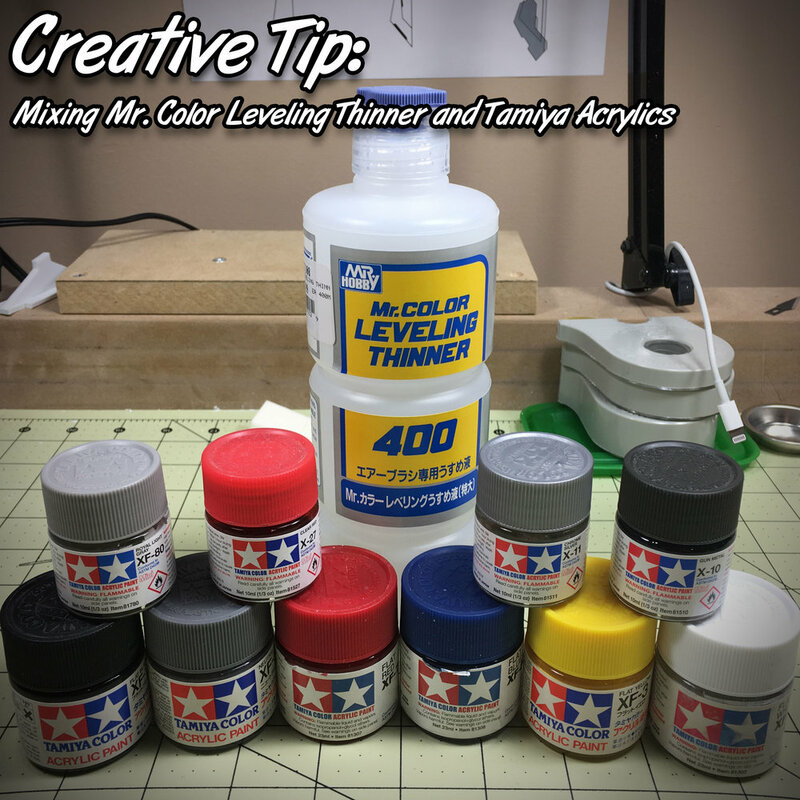 When mixing MLT with Tamiya it gives you a really smooth finish with improved durability and curing times similar to Mr. Color paints. This Creative Tip will greatly expand your available color choices! For best results, make sure to prime your model with either Mr. Surfacer or Tamiya Surface Primer L. Mixing MLT with other paint brands is possible, but make sure to test before spraying your model. The base blue on the Blue Destiny is Tamiya Flat Blue mixed with MLT. All other colors were Mr. Color that were sprayed over top of the Tamiya Flat Blue. Most of the colors on the Gundam ver. Logic are Tamiya mixed with MLT. If I remember correctly only some of the darker grays were Mr. Color. The Petit Nu Beargguy was painted completely with Tamiya mixed with MLT. Even though MLT is magical in its own right, it's still not enough to strengthen weaker paint. So after the overwhelming success of Tamiya mixed with MLT, I decided to try other brands. In this case I picked up some Model Color paints by Vallejo and Model Master acrylic. Mixing the paints with MLT went as expected and had no issues. Spraying also went really well. The paint went on super smooth and leveled out beautifully over a primer coat of Mr. Surfacer 1000. I gave the spoons several hours of cure time to harden up. And as you can see they scratched, so I gave them a full 24 hours to cure and needless to say I was very disappointed to see no change in durability. They scratched very easily with very little pressure so putting these paints up against moving plastic parts would have been a disaster. *NOTE: As of writing this I have not tried any other paints mixed with MLT, but will probably be trying some in the future. I'll update this with future findings.